"No one can take your memories from you... can they?" In a futuristic London, the world is divided. Living in the dirty slums of the South is Seven, a orphan and a thief, but what he trades and steals aren’t your average black market items. Seven steals memories. He’s a Skid Thief and pretty proud of his ability to surf the memories he illegally comes across. Then there’s Alba White, the teenage daughter of London’s most unforgiving criminal prosecutor. She lives in the rich, over indulgent North, where you’re nothing if you’re not keeping up with appearances and you never stray too far from the status quo. After reading The Elites, I was super excited to get my hands on Ngan’s second novel. This one sits in the familiar yet fresh territory of dystopian/utopian fiction. You have your supposedly status quo world of a divided London with some serious income equality and crime problems. We have our two leads, Alba and Seven, in a sort a-typical Romeo and Juliet/two star crossed lovers from opposite ends of the social system type romance - though in this case it’s safe to say it was not love at first sight, more like love at first death threat. And we have our futuristic tech, memory surfing and memory trading. The premise of re-visiting and erasing memories certainly isn’t new, but the way Ngan presented it makes it feel fresh. Now for a little detail. Seven is a character I feel like I’ve seen before, he’s a scruffy teenage orphan, cynical and extremely street-wise. A loveable rogue, I feel like we’ve only just scratched the surface of with Seven. Alba on the other hand for me is the more interesting of the two. She’s jaded about her privilege and her life in the North. Plus despite having two parents, she’s basically raised herself on her own moral code. Her rocky relationship with her mother, Oxanna, offers a nice dynamic shift from seeing a father-figure become the overbearing parent. The plot, as I said, feels familiar. It’s fast paced, the secrets revealed aren’t wholly unpredictable but I like to think it’s because I was really clever and figured it out ;) What really drives this plot is Alba and Seven’s relationship with each other. The development in their relationship is what will keep you going and I found myself wanting to read on because I totally shipped them from the get-go. It helps that the story is written from a dual perspective so we get all their feelings and emotions as a running commentary to the plot. The ending and final 'battle’ do actually felt a bit rushed though, and despite what's everything Alba and Seven have gone though the resolution feels a mix too easy. 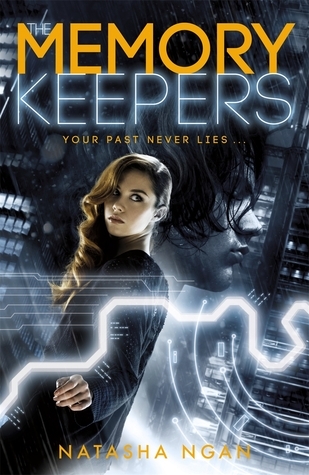 Ultimately The Memory Keepers feels like it’s aimed at a younger YA audience than The Elites. I for one would love to know more about the politics of the world and the inner workings of the criminal underground, but I get how hard that would’ve been considering the structure of the narrative. It's an interesting ride none-the-less and I'm itching to read more. Great review Ria! I have had The Elites & The Memory Keepers on my wish list for so long I may need to buy them very soon . I love your "reading soundtrack" feature !